Without fail, whenever I want to hang something heavy on my drywall there is not a stud in that spot to support it. I like to change things up on my walls often, and I detest those plastic wall anchors. Typically when you want to hang a heavy item on the wall where there is no stud, you have to get out your drill, drill a hole, hammer in a wall anchor, and then screw in a large screw. Removing wall anchors is a pain and patching the wall after removal never looks perfect. 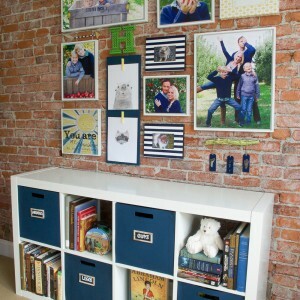 I knew there had to be a better way to hang heavy items with minimal wall damage! Some of you already know this brilliant little invention (why didn’t you tell me! ), but others might still be in the dark. If you’re still in the dark like I was, I’m about to change your life! To hang something perfectly the first time, I like to make a template of the item out of butcher paper and tape it to the wall exactly where I’d like it to be. Next, I measure and mark where the holes need to be. And this is where the magic comes in! This little hook can be found under similar names such as Monkey Hook ,or Hercules Hook, or Super Hook and you can find them in the picture hanger section of the hardware store or on Amazon under the previous affiliate links. The hooks come in various sizes depending on the weight of your items. What is so brilliant about these is that you do not need ANY power tools to pop one of these in your walls and it will take you less than two minutes to hang your heavy items! You simply (1.) push the hook into the wall, (2.) twist the hook right-side up, (3.) and then push it all the way in until just the hook is showing. That is it! And when you need to remove the hook all you have left to patch is a teeny-tiny nail-sized hole instead of a big ugly anchor hole. Where have these been all my life and why am I just finding them now?! I used these to hang both bathroom mirrors which each weigh around 10 pounds. I also used them to hang the mirror in my master bedroom. I didn’t want to damage my newly installed plank wall with ugly anchors! To hang on the plank wall, I did need to use a tiny drill bit to puncture the wood and then proceeded to use the hook as outlined above. 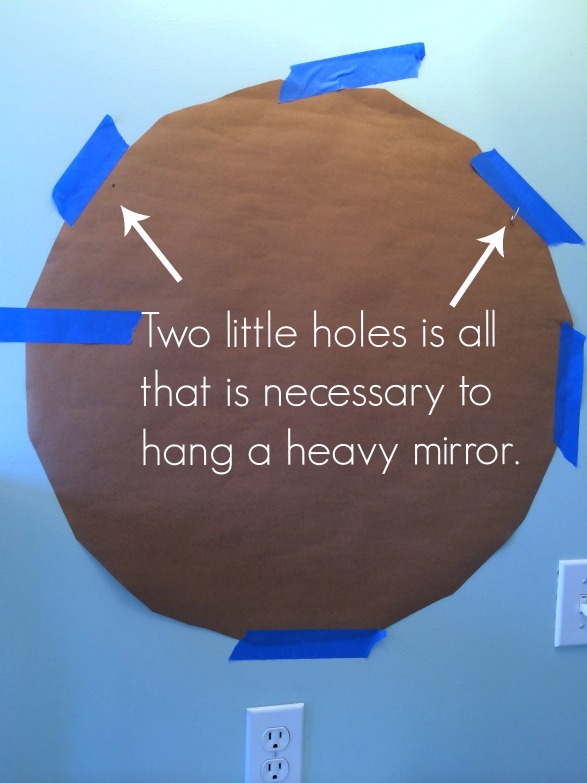 I am thrilled that when I want to switch out this mirror I won’t have large holes to patch on my wood wall. I guess it goes without saying that this does not work if the mirror does not have some kind of hanging mechanisms on the back to connect to the monkey hooks, correct? A certain big box store, for example, sells bathroom mirrors that have nothing on the back, and you have to either use those (awful) clear plastic edge brackets or liquid nails (contractor’s glue) to hang them. Yes, this is meant for wall items that contain hanging hardware already in place. Do the hanging items lie flat against the wall? Looks like the curve in the hook would make it stick out. It does look it would, but everything I have hung so far has hung flat. It would probably depend on the size of the item and the hanging mechanism on the back of your art/mirror. Beth! You are brilliant! I have these hook things, but couldn’t figure out how to use them! Lol!!! I wasn’t putting them deep enough into the wall! I tried them and thought…well.. this was to good to be true!!! Lol! Thank you, Thank you! I can now hang my pictures and enjoy them! You rock! And…the moral of this story…sometimes it’s too good…and true! Wow, these look great. And amazingly, they’re available in the UK too (although at about 10 times the price -sigh) as gorilla hooks or Hillman hooks. Hi, thanks for the great tip! I live in an apartment and want to hang curtains but don’t want to drill. What is it like to remove the hooks? With lighter items I’ve been able to remove the hooks easily with only a nail-hole sized hole to fill. However, with some heavier items I’ve had trouble getting the hooks neatly out of the wall. I’m not sure why, or if this was just a fluke with this one particular hook, but I can’t guarantee that it will come out of the wall neatly. These hooks are remarkable! I also found them at the dollar store… and bought about ten packs! …So afraid I would never find them again OR someone would realize their value and the price would become ridiculously high! LOL! The company claims each will hold up to 35lbs, but I trust up to 20lbs each and will use several depending upon the weight of the object. I LOVE them! Although, I have had some trouble unhooking items from the wall for some reason and had to really yank and pull to get my dear head off the wall—which made a slightly larger hole to fill. But overall they are so much easier to deal with than anchors and a drill! Nice find at the Dollar Store! Hi Beth! As a certified Home Stager I’ve been using these monkey hooks for years and they are awesome! I won’t use anything else when you can’t hit a stud. I like how you can get them in difference weight gauges too. My tool kit always has a good supply of these on hand. 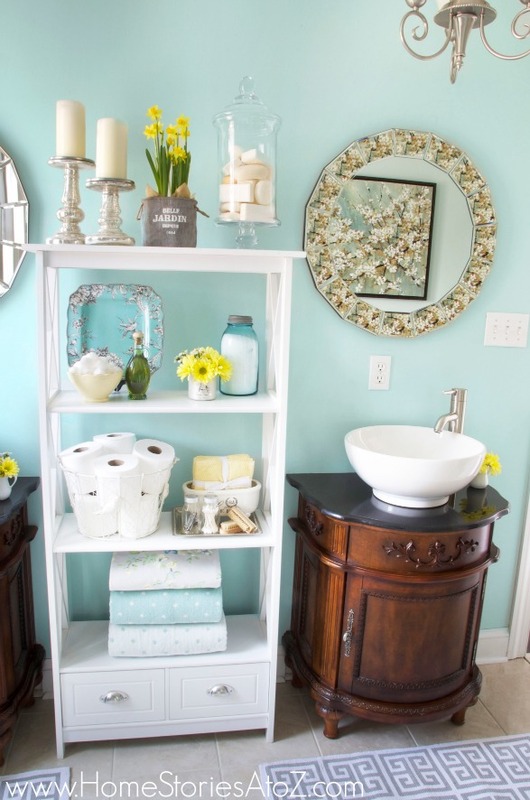 Your bathroom is so pretty – love the vanities and sinks! BTW the new look of your blog is very pretty too! Brilliant! Wow wow wow. Such a great tip! 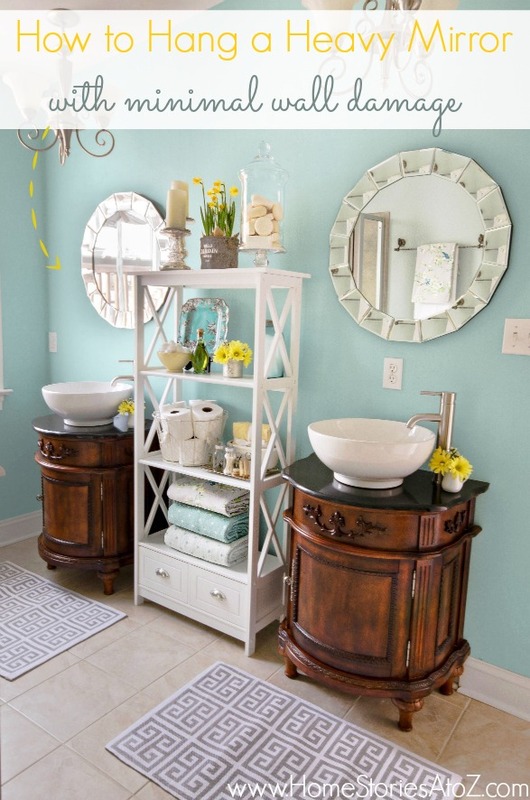 Those mirrors are lovely! Starting to dream up something similar! Isn’t it weird? I thought my only option was to keep drilling and hammering in those blasted plastic anchors. These are so much better! Ha! Yes, I was terrified that it would fall so stuffed a ton of pillows behind my headboard just in case. Holy cow!!! I too was in the dark about these until now!! I’ve been trying to figure out a way to hang my shot glass holder shadow box in my kitchen, and I may have to try this!!! Obviously I don’t want glass all over my floor…no good. Thank you for sharing this!!! I didn’t know about them either. Genius. Thanks for the heads up. What? I’ve never heard or seen these before! OMG! We are in the final stage of a total gut on our farmhouse. You have just saved me tons of headache. Especially sice they didn’t install nailers avove my sinks (wear I ask for them). Wow! I’d never heard of these. And I’ve seen a lot of hanging things and hung a lot of heavy things. I’m a risk-taker so I hang heavy things not in studs nor with those plastic thingies with the big screws. So maybe I should check these out for more security. Thanks for sharing them!! I found these hooks in a pack of 10 at the dollar store. They are amazing! Yes, I think they are exclusively designed for drywall. I have one brick wall in each of my rooms as well, and I use metal anchors and masonry drill bits on those. Sometimes when I’m lazy, I’ll just use a large nail in the mortar. You could drill a tiny hole as she did in the plank wall and I’m sure these would work in plaster. I too have plaster walls and I plan to try it this way. where there is no stud present. But that doesn’t mean some people haven’t tried it on plaster walls. Thank you SO much for sharing this!! My husband does all the hanging in our house, and he insists I always try to find the spot without a stud. He curses whenever he needs to use an anchor. He says whatever goes there is staying there!! I love your mirrors in your bathroom, by the way. Do you mind sharing where they came from? Thanks!